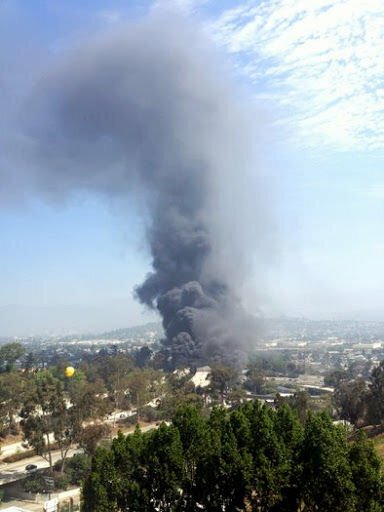 A fire involving a tanker truck broke out under the interchange of the 2 and 5 freeways this morning, sending a thick column of smoke into the sky and flaming fuel into nearby storm drains and the L.A. River, according to nearby residents and business owners. The driver of the tanker truck, which was carrying 7,500 gallons of fuel, was not injured, according to the Los Angeles Fire Department. The fire, which shut down the 5 Freeway and may have caused some structural damage to the interchange, appeared to have begun at about 10:30 a.m. near Riverside Drive, with thick, black smoke billowing around the freeway ramps and through vents in the roadway. Shortly after the fire began at the freeway interchange, a second blaze and column of smoke erupted along the L.A. River after burning fuel flowed into storm drains in Elysian Valley. Architect Tracy Cortez, whose office is on Coolidge Avenue, said trees had caught fire after burning fuel poured into into the river. “There’s fire in the river,” she said. Nearby residents reported hearing multiple explosions as the fires burned, with two columns of smoke at one point rising into the sky above the freeway interchange and along the L.A. River. In its most recent Tweet issued shortly after 12 p.m. the California Highway Patrol said that northbound traffic on the 5 was being diverted to the 2 Freeway. All southbound lanes are open. Meanwhile, traffic on surrounding surface streets in Atwater, Elysian Valley and Silver Lake is heavily congested. Caltrans officials, meanwhile, are taking a look at the freeway because the “structural integrity may have been compromised,” according to a CHP Tweet. It’s not clear, however, if officials were referring to the tunnel where the fire broke out or another part of the interchange. Some initial reports by KPCC and wire services have reported that one person was found dead in a freeway tunnel underneath the interchange but the L.A. Fire Department said there have been no reports of deaths or injuries. Update @ 12:3o p.m.: LAFD reports that most of the fires are under control but not “fully extinguished,” with aerial video showing firefighters continuing to spray foam into sections on the river. Smoke can also be seen rising out of storm drains. Truck fire; Dodger fans should plan ahead.